The Blue Sky Ecological Reserve (BSER) is one of 119 ecological reserves of the California Department of Fish and Game. The primary purpose of the Reserve is habitat conservation. Most such reserves are unstaffed and not open to the public. However, BSER is one of the jewels of this reserve system and is open to the public (hikers only, no bicyclists). BSER has a full-time naturalist on duty (the only staffed state reserve in San Diego County), and nearly 40 docents who offer a variety of programs to the public, including elementary school field trips, guided hikes, campfire programs, and special topic hikes such as Owl Prowls. About 35,000 to 40,000 people visit every year, an average of about 100 per day. Most of these visitors are school groups, with another large group of people exercising there in the early morning and late afternoon. The easy hike along a wide dirt road along the canyon bottom, with only a 40' elevation change in 1.1 miles. The wide variety of challenging hikes available that connect to the main BSER road, all of which involve hiking to a pretty reservoir with sparkling water. The canyon also supports one of the densest stands of poison oak around, which provides beautiful late summer and early fall color. Although this is not a problem to anyone who stays on the wide dirt roads, children and pets must be supervised to prevent them from contacting the plants. Remember that dogs can pick up the offending oil and then transfer it to you, or to passengers that subsequently sit where the dogs sat in your car. Dogs must be leashed in BSER, but you need to make sure they stay on the road and don't "nose around" in the poison oak. Free wildlife/plant walks take place on Saturdays and Sundays at 9 a.m. Walks are slow-paced and geared for the whole family. On the first and third Saturday of each month from 8:00 a.m. to 11:00 a.m, "Discovery Tables" are set up a hundred yards from the trail's entrance, containing such items as pelts from road-kill animals and live baby rattlesnakes in a dry aquarium. Staff and docents are available then to answer questions. Typically about 50 people visit the table in two hours. The Reserve was dedicated October 7, 1989, with the purchase of the 410 acre Blue Sky Ranch. (The property was never a ranch, being owned just as an investment.) The Reserve has continued to grow, and as of the year 2000 contains 700 acres. The Reserve is bordered by permanent open space except for the urban area on the west: Lake Poway is on the south, the Mt. Woodson open-space area is on the east, and Lake Ramona is on the north. BSER is managed by the California Department of Fish and Game, County of San Diego Department of Parks and Recreation, City of Poway, and the nonprofit Friends of Blue Sky Canyon. The DFG manages the land, Poway gives interpretive services, and the county Department of Parks and Recreation pays for a supervising naturalist, who coordinates volunteers, docents and more interpretive help. The Reserve is located on Espola Road, 0.5 mile north of Lake Poway Road (map). Information: 619-486-7238. Terraserver picture and topo map. In the picture, Lake Ramona (mostly dry) is just to the upper right of center, Lake Poway is at the bottom middle, and the curve in Espola is at center left. Blue Sky goes from the curve to just below Lake Ramona, and is mostly contained between the two Lakes. Use the map to specifically find the boundaries. The topo map was made before Lake Ramona was built, so you can see what the area used to look like. ~1980: Friends of Blue Sky Canyon organize to fight trash dumping in the canyon. 1988: Lake Ramona Dam dedicated in August. 1993: Poway pays $100,000 to keep BSER open after the California Department of Fish & Game threatens to close it due to budget cuts. ~1994: Over 100 acres purchased by the California Department of Fish & Game and Caltrans as mitigation land. 1994: State regulations prohibiting bicycles in ecological reserves begin to be enforced on May 1, eliminating about 100-200 bicyclists each weekend. Rival petitions were circulated for (600 signatures) and against (1000 signatures) the ban. The Reserve attracts about 3000 visitors per month, mostly teachers and students. 70 volunteers contribute ~6000 hours per year at BSER. 1995: 2/1 - 7/31 Trial Period for Mountain Bicycle Access (except Saturday and Sunday mornings), to settle a two year debate about the effect of bicycle access on the reserve. A report concluded: "mountain bicycle riding users were observed to have had more than 10 times the violations per user than hiking or equestrian users." 23% of bicyclists violated the rules, compared to 2% of noncyclists, and there were fewer sightings of animals during this period (SDUT 10/18/95, B1-4). 1996: Purchase of 94.7 acres of wildlife habitat from Prop 117 funds. 1997: Purchase of 16 acres north of the entrance to the Reserve for parking and a future interpretative center using $305,000 in grants. $200,000 came from the California Transportation Commission's Environmental Enhancement and Mitigation fund and $105,000 came from the California Wildlife Conservation Board. June 1997: Eagle Scout Benjamin Selensky of Poway's Troop 479 creates the reserve's information board, an explanation of the area's four habitats -- chaparral (the Elfin Forest), coastal sage scrub (the scented forest), riparian (a canyon oasis) and oak woodland (the wild woods). May 2001: The popular Park Ranger since 1996, Paul Kucharczyk, is to be transferred to a county environmental education program in Bonita. Many volunteers at both Blue Sky and Goodan Ranch are very upset, and 50 people protested Paul's reassignment at a meeting of Poway's City Council. The reason for the transfer was unclear. Four people said that the transfer was from a personality conflict between Kucharczyk and council member Betty Rexford, who serves on the Poway committee that oversees Goodan Ranch. Rexford denies that, but also said she would not support a community effort to retain him. However, City Manager Jim Bowersox acknowledged under questioning at the Council meeting that complaints about the ranger were passed on to parks officials. I couldn't find anything to back that up. What the county parks people told me was that they normally transfer rangers every couple of years and that Paul's five-year tenure here was unusual. July 2001: Maureen Abare, a 12 year veteran of the County Parks and Recreation Department, takes over as Park Ranger. 4.0 500 BSER to Lake Poway / Mt. Woodson Trail Jct. The BSER to Outdoor Classroom samples nearly the entire length of BSER, and is a short delightful easy stroll. 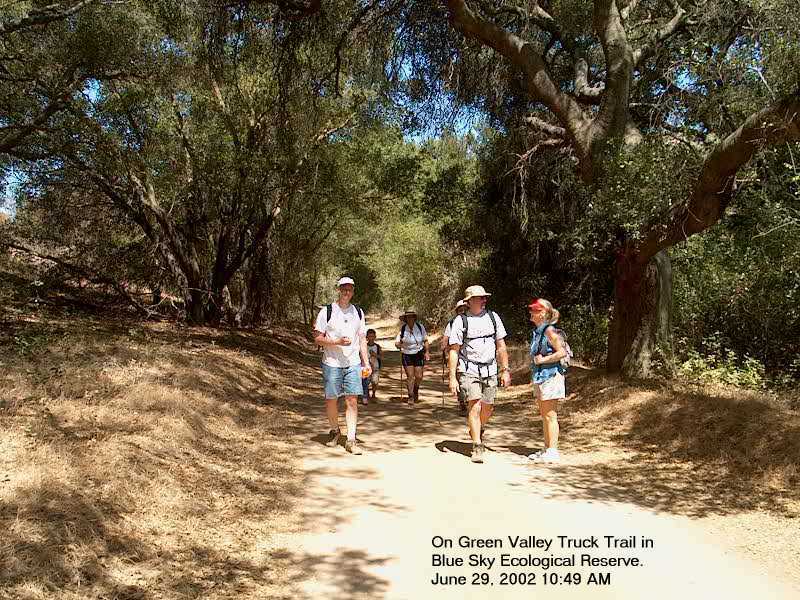 All of the other hikes travel along the same route to within 0.1 mile, and then hike out of the canyon to either Lake Ramona or Lake Poway and beyond. SDUT Archive articles on 6/6/99, C18 and 12/3/00, NI1. WRENDERINGS: Reports, Fall 1997 Reflections from Square L12, Blue Sky Ranch, San Diego County Bird Atlas. Includes brief comments on 30 years of changes here. Photo of BSER from Philip Erdelsky. $305,000 allocated in 1997 (duplicate page) "for the purchase of 16 acres adjacent to Blue Sky for a parking lot to serve visitors and possibly an interpretive center". Last update: 25 December 2001.